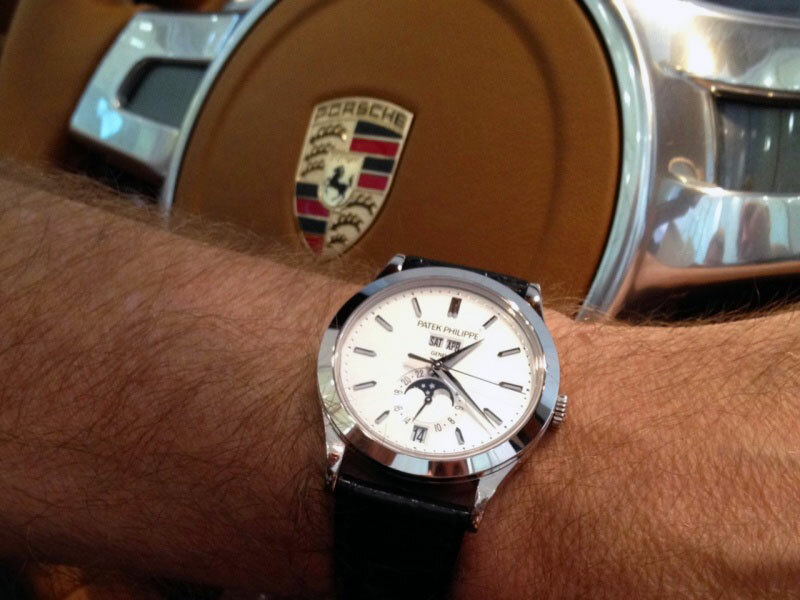 "Very impressive Patek Philippe blog! Loved the 1591 and the platinum 2497s. Check out this one, my personal favorite ever, now in the Patek museum. It's ref 570 and it should be a good fix to your obsession anyways." Well Marcello, you are absolutely correct!!! What a treat!!! I have never seen this watch, and I am blown away!!! 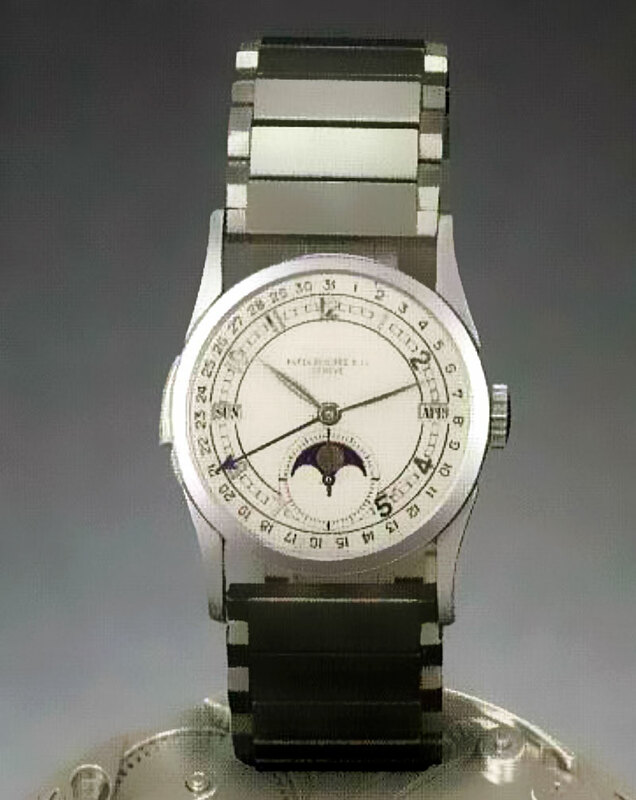 I realize the quality of this photo is not that great, but what an amazing Patek Philippe!!! This watch sold at an Antiquorum auction in 1996 for 2,093,500 CHF, which is $2.3 Million. In 1996!!! Twelve years ago!!! Can you imagine what this must be worth today!?! "Patek Philippe & Cie, Geneve, "Calatrava", No. 198340, case No. 618840, completed in 1939. Unique astronomic, minute repeating, platinum gentleman's wristwatch with perpetual calendar and moon phases, with a heavy platinum bracelet. C. massive, polished, satined. D. mat silver with applied platinum Arabic numerals + auxiliary seconds dial, outer graduation for the days of the month, apertures for the days of the week, the months and the lunations, the moon disc is made of enamelled platinum. M. 11 '' rhodiumed, "fausses cotes" decoration, 29 jewels, lever escapement, cut bimetallic balance adjusted to heat, cold isochronism and 5 positions, flat balance-spring, repeater on gongs by means of a slide on the band. Dial, case and movement signed. In excellent condition. Diam. 31 mm. This watch is published in "Patek Philippe Wristwatches", pages 240 - 241. This amazing work of art by Patel< Philippe, of very high quality, is considered as one of the most significant and representative pieces of 20th Century watchmaking. A masterpiece of horological engineering, execution and creative skill. This watch is also published in "Watches " by George Daniels and Cecil Clutton and it is the only prestige wristwatch illustrated in this "bible" of horological literature. This watch was formed in the Bloomfield collection, San Diego, CA. This piece was sold by Antiquorum on 4 October 1981 for the amazing sum of SFr. 185 ' 000. This price and this record triggered the outbreak of the collectors' wristwatch market. As a comparison with some of the most collectable wristwatches, hereunder are their 1981 estimates: - Patel< Philippe astronomic gold wristwatch with perpetual calendar and moon phases, Ref. 1526: SFr. 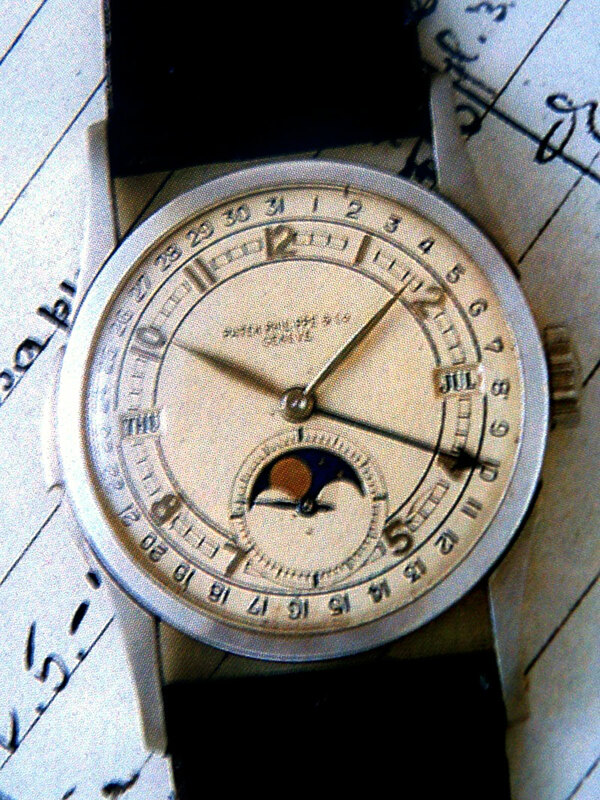 16'000 - 20'000 - Patel< Philippe astronomic gold wristwatch with square button chronograph, register, tachometer, perpetual calendar and moon phases, Ref. 1518: SFr. 25'000 - 30'000 (This particular example is extremely rare with a "Champagne" dial !) - Patek Philippe self-winding gold wristwatch with enamel dial, Ref. 2526: SFr. 3'800 - 4'200 - Patek Philippe gold waterproof wristwatch with round button chronograph, register and tachometer, Ref. 1463: SFr. 5'500 - 6'500 - Patek Philippe gold wristwatch with split-second chronograph, register and tachometer, Ref. 1436: SFr. 13'000 -16'000 - Breguet No 2926, unique Art Deco platinum, "Perpetuelle a Masse", self-winding wristwatch with date and power reserve indicator: SFr. 9'000 - 12'000. This watch, lot 172 of The Art of Breguet" sale in April 1991, by Antiquorum, so ten years later, was sold for SFr. 126'500! This comparison fully demonstrates the extraordinary price reached by this exeptional wristwatch in 1981. It is the first time since 1981 that this watch reappears on the Auction Market and since then wristwatches have enjoyed an ever increasing fascination for collectors all over the world."